I’ve been thinking about my life lately. Partly because it helps me grow but mostly because I had no choice. I went to a woman’s retreat and it ended up being about inner healing. I. Did. Not. Want. To. Go. But I went. I had to face my childhood, my fears, and my mistakes. I had to forgive, let go of judgements, ask God for forgiveness and start new. I had to allow God to touch my heart. I did. 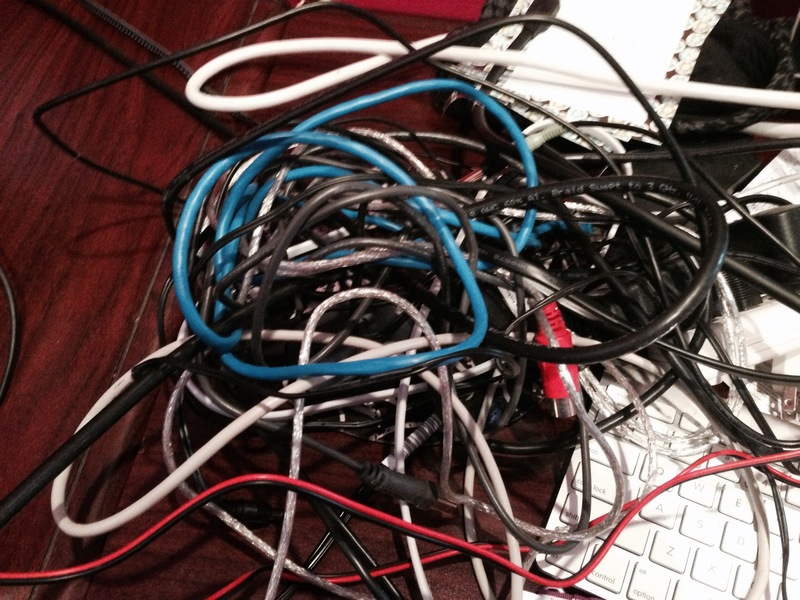 I am reorganizing my office right now and I’m fumbling through all these wires. I pulled on one wire that was connected to a larger box and I found that same wire also went through our floor. It’s the cable that provides our internet service. I also realized I wasn’t going to get very far if I kept trying to untangle that wire first. Luckily for me, there are lots more wires to choose from. As soon as I shifted my focus from the large wire to a smaller wire I was able to pull that one right out of the mess and could see right what it was connected to. God does the same thing with our lives. He untangles one twisted wire at a time! We each have hurts from “friends”, friends, past loves, family, teachers, bosses, co-workers, church goers, leaders, preachers, losses, and deaths. We each have regrets. We each make mistakes daily. When we look at the mess all at once it is so overwhelming and so easy to just cover it up and hide it or say “I’ll get to that later”. But when we allow the Holy spirit to teach us and we allow the hand of God to touch us our heart can be mended. Each stitch over each broken piece can be wiped away one at a time. We can grow. We can be new because of the sanctifying blood of Jesus. He is all powerful! We conquer the devil and his plans and purposes by the BLOOD OF JESUS AND OUR TESTIMONY!!!! PRAISE GOD!!! I have a testimony! I’ve been through mess! I am redeemed! I am set free! I am a brand new creation! That’s the power in the blood that was spilled for me on the cross. That’s the power in the tongue. Today I ask you to turn over your brokenness to Jesus! Take your pain and share it. Give life to someone else. Allow the blood of Jesus to defeat the enemy in your life and allow your testimony to help set others free. Really good. Really wise. Really neat. Thanks.